These easy cold appetizer recipes are a tasty addition to any get together. 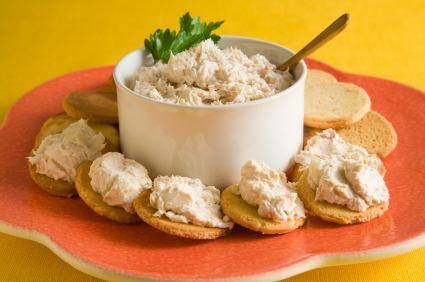 I'm offering appetizer spread recipes from scratch that are eaten with crackers. These homemade cracker spreads are a great way to start out a any party or meal. From liverwurst to pate' - I've included many homemade spreads for you to choose from my easy cold appetizer recipes for your next get-together. Mix ingredients thoroughly and roll into a ball. Refrigerate overnight and serve with crackers. Combine all ingredients and chill for at least 2 hours. Serve with bread or crackers. I really do like this easy cold appetizer recipe. Another easy cold appetizer recipe that is sure to please. Mix well until creamy. Chill for at least two hours, and serve with crackers. In a blender, process the garlic, sour cream, Italian dressing mix and red pepper flakes until smooth. Drain and squeeze the excess moisture out of the thawed spinach and add to the blender. Process until chunky. Now fold in the roasted red peppers and mound this dip in the center of a appetizer tray and sprinkle with paprika. Serve with a variety of crackers or vegetables. The following is one of my favorite easy cold appetizer recipes. Mix the cream cheese and mayo until smooth. Stir in the green chilies and jalapenos. Pour into a greased baking dish. Sprinkle with the Parmesan cheese and top with the bread crumbs. Bake for 30 minutes until golden brown. Serve with baguettes, tortilla chips or crackers. Yum. This easy cold appetizer recipe is excellent between two slices or homemade bread and lettuce, or as a dip served with toasty rounds of crusty bread. In a skillet, fry the bacon pieces until crispy, drain. In a bowl, mix the mayonnaise, sour cream and minced garlic together. Add the seeded cubes of tomatoes and fold in. Chill for 1 hour and serve. In a food processor or blender, process the butter, sour cream and cottage cheese. Stir in the remaining ingredients and season with salt and pepper to taste. Serve with dill rye, pita chips, appetizer-sized deli breads like light rye slices or buttery crackers. Snack away. Process the first 7 ingredients until smooth and creamy. Fold in the crab meat. If this spread is too stiff, add the wine or even milk to thin it out. Cover and chill overnight before serving. Garnish with chopped parsley and slivered olives. If your having a party, this is the spread for you. It makes 6 cups of tasty spread. This needs to chill overnight. In a large bowl, cream the butter and gradually add the cheese spread. Add the remaining ingredients and put in a serving bowl. Chill overnight. Serve with a variety of cracker or chips. Combine all ingredients and mix well; season with salt and pepper to taste. Chill for at least 2 hours before serving. Great with a variety of crackers or celery. Combine ingredients in a blender or food processor and process until it becomes a stiff paste; approximately two minutes. Line a three cup mold or bowl with saran wrap and pack in pate mixture. Cover and refrigerate overnight. Unmold and place on a serving plate and garnish with parsley. Serve with crackers or melba toast. This easy cold appetizer recipe is an excellent choice. Melt cream cheese with the tomato soup in a saucepan. Stir in the gelatin and stir well. Take off the heat and cool. Add the remaining ingredients and place in a serving bowl. Chill at least 3 hours before serving. My easy cold appetizer recipe makes a yummy spread. Speaking of spreads this easy cold appetizer recipe makes the best steak topping. Melt the butter in a skillet and add the mushrooms and onion; fry until tender. Sprinkle with flour, reduce heat to low and cook for 5 minutes. Now add the garlic powder, lemon juice and then season with salt and pepper. Place in a baking dish and top with parmesan cheese. Put in the refrigerator overnight for best flavor. When ready to serve, preheat oven to 375 degrees. Bake for 15 minutes or until hot and bubbly. Serve with crusty french bread or garlic pita chips. PREHEAT oven to 350 degrees and you will need a 9" springform pan. In a skillet over medium-high heat, add 1 TBS of the butter and saute the mushrooms until soft. Add the crushed crackers and stir well; remove from the heat. Place this mushroom mixture in the bottom of the springform pan. In the same skillet, add the other TBS of butter and saute the green onions for two minutes and layer over the mushroom mixture. Now sprinkle the cheese evenly over the onion mixture. In a blender, process the cottage cheese, eggs and cayenne pepper. Pour this mixture over the cheese. Sprinkle with the paprika. Bake for approximately 30 minutes and cool before cutting into bite-sized pieces. I have more than just easy cold appetizer recipes, check out more of my favorites on the navigation bar on the left.